It has long been accepted in the chameleon community that the highest level of husbandry is to produce multiple, successive generations of a species under captive husbandry. As we cannot simply ask the chameleon how it feels we must take clues to our success from other sources. The best secondary parameter is the chameleon’s ability to hatch/be born, grow-up, breed, produce healthy young, and live a long, healthy life under your care. But his ultimate display of husbandry achievement is more than just a badge of personal accomplishment. It is the first of two keys to establishing long-term captive populations independent, at least for a time, of wild caught exports. The chameleon keeping world has held this holy grail from the beginning. So, one would ask, why it is so hard for us as a group to execute on this? Why, with all the dedication and experience we have, are there few species established in the community? There are two main reasons. Distractions and burn-out. Distractions. Back when chameleon keeping really took off, in the 90s, the hobby was young and the distractions were many. How in the world could you stick with only one species with everything Madagascar could throw at us? And Uganda. And Tanzania. And Cameroon. We were kids in a candy store and new candy constantly filled the shelves. Our earliest community, the Chameleon Information Network, had a members list with species experience listed after our names. A source of pride became how many species followed your name. There was an unspoken premium on quantity, though we all knew it was quality we were searching for. And, to be fair, we did push for quality. We did achieve multi-generational success. It may be hard to believe, but there was a time when Veileds were new to the hobby and it was a victory to establish them! I, personally, remember the joy I felt at achieving F3 F. pardalis! We were also breeding other species, but the current situation speaks for itself. What species, that are no longer imported, are established? So what happened to the serious breeders that were able to rise above distraction? Burn out. In the 90s, we all heard the herpetoculturists on their soapboxes preaching on the merits of captive bred animals. And then we watched wild caught animals flying off the shelves, leaving the captive bred babies behind. Even if you sold babies at the same price as a wild caught, there were relatively few people that would buy a baby when they could get a full blown adult in all its glory! And for a little more, they could get a female and make their own babies! So why create more babies with all the costs associated and take on the headache of placing them? Notable exceptions were Panthers and Veileds. These were easy to move and had a financial component to them that negated burn out. Yes, for the other species there was an intangible feeling of satisfaction and success with continued captive generations, but there was no push other than a philosophical one. Why would you need to do it twice? But times change. The good news is that conditions have arisen where multi-generational breeding has taken a firm hold and the social situation is such that it looks to have some long-term momentum! Three multi-generational breeding projects are well developed with a couple more working to catch up. This article seeks to introduce these pioneers with the hopes that recognition may be given to their achievements, but more so, that you, the reader, might consider banding together with them and being part of the success which benefits us all. 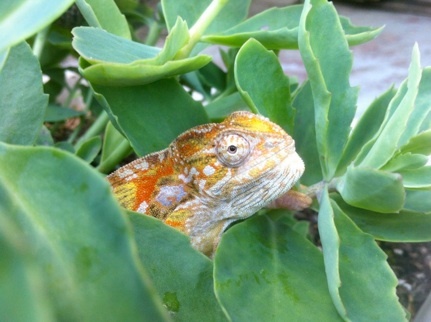 Four years ago, after a sabbatical from keeping reptiles, Luis and his wife Nicole decided to get back into keeping reptiles and decided to include chameleons. With no specific goal of saving the cold blooded world, he decided to focus on one species as it would be more gratifying and, with only one environment to create and maintain, easier. Trioceros deremensis was chosen as it was one that both he and his wife enjoyed. They ended up with three bloodlines (male/female pairings) and quickly found that keeping the pairings and bloodlines straight required the same discipline as it takes to run a business. Each animal has its own ID history which starts at hatching or purchase and ends with death or the new home. Luis’ greatest challenge is planning out the breeding schedule. 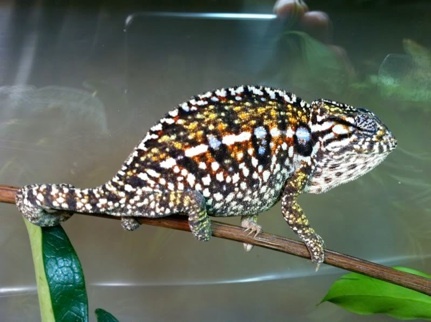 T. deremensis is a high producer and, as is the case with most specialty chameleons, it would be a very easy to saturate the market. An aggressive breeding schedule could easily see 120 eager babies looking for new homes. Although at the right price any chameleon baby will sell, Luis has strong convictions as to whom he sells to. And, this is a dilemma faced by anyone with a breeding program that is done for the animal and not for a specific market. Do you lower prices and sell less judiciously? Or do you place strict controls on your breeding calendar? Do you establish an ethical culling process? That’s for each breeder to decide. Luis has F2 adults that he is preparing to breed for F3. He has no end goal and no view of when he would stop working with T. deremensis. He and Nicole patiently enjoy each step. And they must have exceptional patience. T. deremensis is slow to mature and may take 18 months before they are ready to breed. 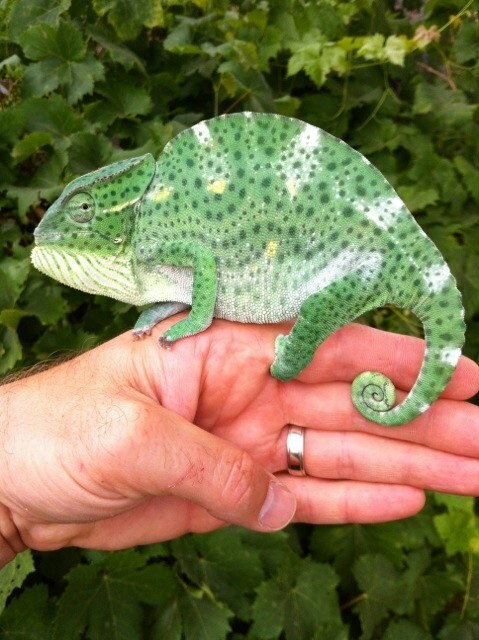 When asked how he avoids burn-out he thought for a second and replied, “ I relate my chameleon keeping to a relationship. You eventually get over the infatuation. So your heart doesn’t skip a beat every time you see the animal now. You are developing a long-term relationship. They become a part of your everyday life rather than your every day enjoyment. They add to your environment and the life you want to live.” He has hit on a powerful truth here. With a dedicated attention, we end up not just “keeping” chameleons. We live and interact with them. They become part of who we are and add to our understanding of the world around us. Back in 2008 Louis got his first K. multituberculata. His species choice was made by a combination of availability, affordability, and an environmental match to his home conditions. He didn’t have any specific plan, but ended up with 6 pairing bloodlines across 14 breeders! At the time, K. multituberculata was very common and being shipped from Tanzania at relatively low prices. Obviously, this was a labor of love as there was little market for anything that cost more than a couple crickets to bring to market. But there were a group of people who placed high value on a captive bred specimen and Louis was able to sell his babies and continue his work. One of his strategies for success was him raising up a community effort around his love for Kinyongia with the Kinyongia Chameleon Keepers club. The KCK is an informal group that coalesced around Kinyongia enthusiasts and provided a way for that group to communicate and coordinate their efforts. It became a way for many of Louis’ customers to become breeding partners. And then the unforeseen happened. In 2011, Tanzania closed to exports. To anyone outside Tanzania, both T. deremensis and K. multituberculata, along with a host of other species, became genetic islands with no further infusion of wild blood. This was a completely unexpected turn of events to test both breeding groups’ longevity. Louis feels that he and his KCK friends have enough bloodlines and success to keep K. multituberculata in herpetoculture for at least ten years and figures that sometime before then at least some shipments will find their way out for a new transfusion of blood. This is a lesson for us all that we continue to learn. The “cheap” chameleon of today becomes the rare chameleon of tomorrow. Remember when C. parsonii went for $75 to $1000? Remember when T. montium was all over the place as the “cheap” chameleon? And now both are represented by a few scattered genetic islands. Perhaps we should apply some of this foresight to the species we have in front of us now. T. jacksonii xanthalopus is easily found at just about any show or reptile store. The species is hardy, attractive, and easily bred. They currently come from Hawaii, which has no true legal way of export. Here is our reality check: the presently ubiquitous Jackson’s Chameleon is a hair’s breath away from disappearing from herpetoculture. It is hard to imagine, but one look at history shows how easily it can happen without warning. This is a species candidate worthy for a group wishing to begin a long term multigenerational breeding project. Now is the time. Louis is as surprised as anyone that he is now the figurehead of K. multituberculata in captivity. 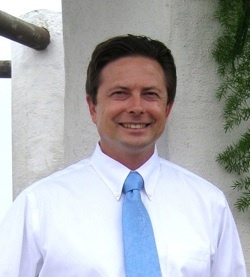 His stated goal is to continue onward and to avoid “crash and burn”. Crash and burn is an unfortunate fact of life. Whether through hobby burn-out, unavoidable family situations, or career changes, it is all too common to run into a situation where you are no longer able to keep chameleons for a certain length of time. Luis had a time like that in his past. I know I had a time like that recently. You never know when you find yourself back at ground zero. Louis hopes that should an unforeseen event occur which requires him to stop keeping K. multituberculata, that the community will be established enough that the pioneering work he started will continue. “The greatest thing about keeping an uncommon chameleon is that it gives anyone a chance to add to our knowledge of the natural world. The chameleons we are talking about here are all vulnerable to extinction. F. lateralis has a short life span. T. deremensis is slow to mature and reproduce. K. multituberculata only exists in a small geographical area. T. montium and T. quadricornis are threatened by deforestation. There are few, if any, studies in the professional world focused on these animals, their habits and reproductive needs like they are in our living rooms and backyards. By keeping these "underdog" species a hobbyist can help figure out how to take care of animals that we don't completely understand. By communicating our findings we can gain enough knowledge to keep a species alive in captivity, even if it goes extinct in the wild. That said, there are many dangers to our man-made populations of these chameleons. For whatever reason, the ones we manage to reproduce in captivity do not always go to the best homes. When I sell a chameleon and never hear back from the buyer I am forced to assume the worst. New specimens in Africa are getting harder to find so every single one we have here is extremely important. Environmental laws are getting stricter and reptile owners’ rights are constantly challenged. In the early days my project was carried out in secret and could have gotten me kicked out of my home! The biggest threat is the fact that we are keeping these chameleons in a simulation of their natural surroundings – one single problem like a blackout or broken thermometer could instantly eliminate a huge chunk of the captive population. 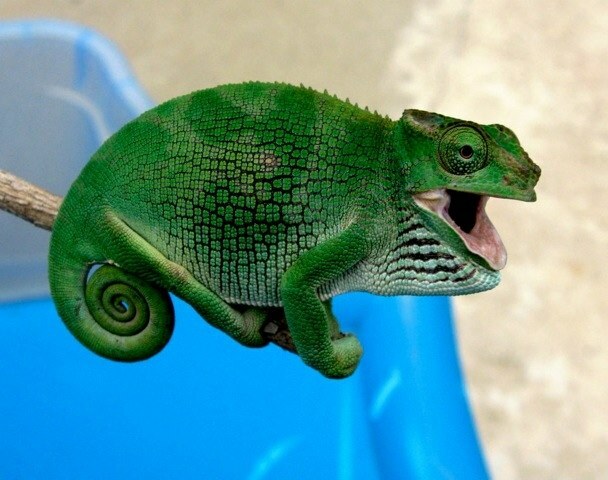 Every time a single chameleon dies we loose a unique animal that will never again breed or even zap a cricket. Kevin cannot back away from a challenge. And F. lateralis was a challenge. With such inconsistent incubation success and complicated theories of diapause being batted back and forth he jumped in to unravel the mystery. He meant to conquer the species and unlock its secrets. But he immediately ran into complications and frustration. Babies would not hatch and those he helped from the egg mostly died. And that is where most F. lateralis stories end. Kevin was determined that his story would not end that way and so he pressed forward and persevered. For those who are active on the internet forums or have read Kevin’s previous article in this E- Zine you know that he succeeded. 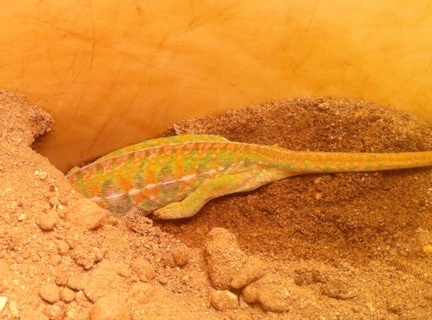 Kevin is currently incubating F5 eggs in one of the chameleon communities real success stories. His secret? He didn’t give up. Pure and simple. The result? He is now incubating F5 eggs. His answer to the most pressing question of F. lateralis breeding, “how do you incubate?”, is surprisingly simple. He incubates in a mixture of 30g vermiculite to 20g water at a constant 70 degrees F. They hatch out in 7.5 to 16 months. Many times the same clutch will hatch out over long lengths of time. 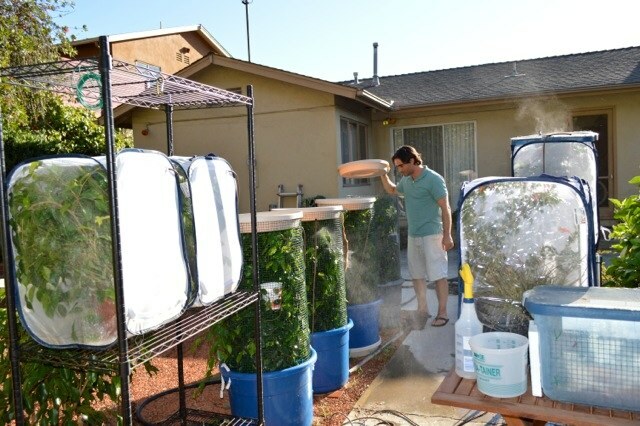 He struggled with different diapause strategies, but found a simple constant temperature worked the best. F. lateralis is a species that needs a wider breeder base. Although F. lateralis is quite popular, many of the homes that Kevin’s babies go to do not become breeding homes. With F. lateralis still being brought in occasionally from Madagascar there is less of a sense of urgency. This, of course, sets us up for a false sense of security. 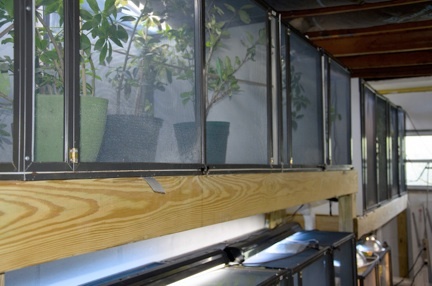 Great work has been started and continues to be done with F. lateralis, but the breeder base has not yet been established enough to weather a shut down of imports. The shorter F. lateralis lifespan of three years is also a concern. By time a T. deremensis becomes sexually mature, F. lateralis is entering its golden months! Things happen quicker in a F. lateralis world. But this is also an advantage. For those who want a project with a shorter start to end F. lateralis is a perfect place to start. And with smaller housing requirements, people in apartments, or other space constrained conditions, are able to become part of this exciting work! Both sub-species of Trioceros quadricornis, the Four Horned Chameleon, are also represented by a developing coalition organized by the author of this article. There are no rumors of Cameroon shutting down exports, but there is no denying that they have dramatically slowed down. There are enough pockets of breeders around that by connecting them we have a definite chance of establishing T. quadricornis quadricornis long term. Whether T. quadricornis gracilior can be established with the reduced representation is still in question, but with the number of people desiring to be part of this program it will take just one import season to fill the ranks. 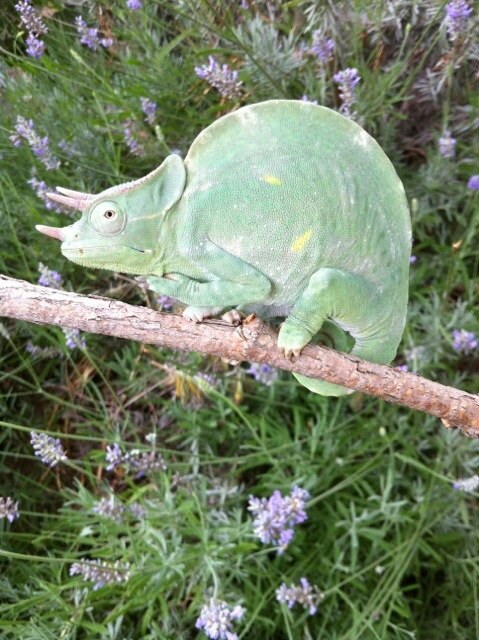 Chris Anderson, the editor of this E-Zine and a well-known name in the chameleon community, has quietly reached out to T. montium keepers. 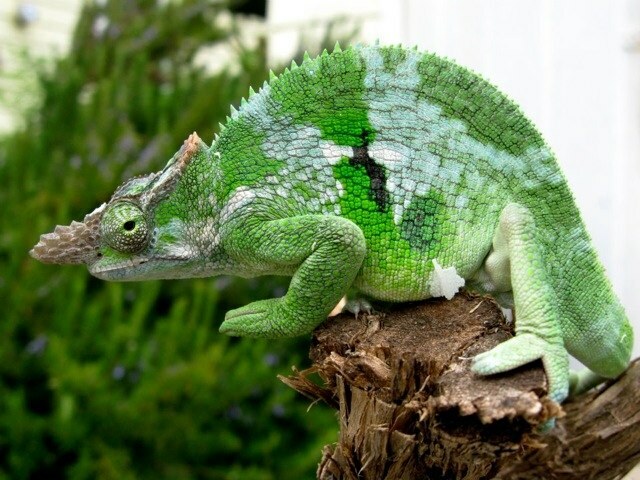 Imports are sporadic on this amazing chameleon. If you have specimens of T. montium or are interested in joining together with those working with the species now is the time to get in contact. Hopefully, it is not too late to establish at least a small community. There are many loose coalitions of breeders who know of each other and trade bloodlines. But this article describes a handful of organized public “communities” that are available to join. Although started and managed by an individual, none of these is a commercial venture. They are centered around one breeder who is looking not for a fandom, but a community to strengthen the number of breeders working together! At the beginning of the article I mentioned the first key to establishing a certain species in herpetoculture was proficiency in the captive husbandry. The second key is community. It rests on us in the chameleon keeping community to come together and do it. If we sit back and flit from one species to another and stick in our own personal world then we will lose species as the countries close down. As humans continue to destroy natural environments it will only get worse. The good news is that with how far we have come in keeping chameleons coupled with the ability to network with keepers across the globe it is very possible for us hobbyists to make a difference. All we need to do is to continue doing the breeding we love so much, be organized, and leverage the advances in social networking to stay in touch. The three herpetoculturists featured in this article have no different lives than any one of you. They all have jobs, limited budgets, and significant others that may have a say in what the house is filled with! They just made a decision to stick with something and dove in. How can you be involved? It is simple. Pick a species that you have a passion for and become a community member. Just within this article you have been exposed to five communities in different stages of establishment. Each one of these has a Facebook page that you can visit to join the effort. If you already have a breeding group or are jumping in feet first with a group then, by all means, join up, communicate, and trade bloodlines! If you can only handle one pair then this is the perfect place to present a new bloodline and have an easy sales outlet for your babies. If you are just interested in a pet there is no better start then a captive bred baby from an experienced breeder. Now you know where to find them! And if you have interest, but do not know when you’d be able to get an animal or join the effort then tap into the community and you be very well connected when the time is right. 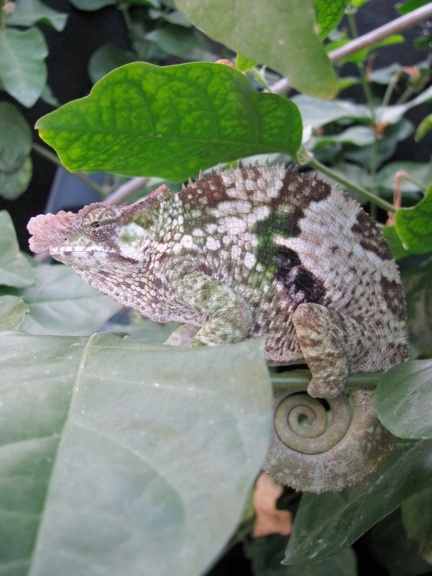 The standard stereotype of a chameleon breeder is a person who keeps to themselves and does not share their latest techniques for breeding or incubation. For those who make a living from breeding this is understandable. But for those who are part of breeding communities you will find a much different attitude. Within these communities the more people who are successful the stronger we all get. Some of these species are very low producers and will never be commercially viable. The more people that are breeding the species, the higher the probability that the community will have longevity. I invite the readers of this article to focus their efforts, band together, and take pride in accomplishing something bigger than what each of us individually could achieve. 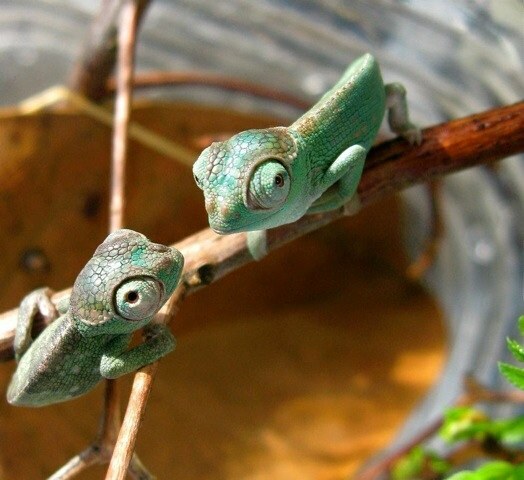 Although we are seeing fewer chameleons being imported this is actually an exciting time for chameleon keeping. We are well positioned to make a difference in the chameleon keeping world that we will be living in for the next ten years. The goal really isn't to prove how many generations can be created under captive conditions, but to create enough of a breeding community that the species is established and will not be a memory a year after the exports stop.